"Meet at the pick-up point and visit the first place - pearl farm to learn about the cultured pearl industry. The next stop is Local Sim Wine factory to see the manufacturing process and taste all kinds of local wines here. Then, visit a pepper farm and learn about pepper harvesting. The fourth destination is the lovely and simple Ham Ninh fishing village to understand routine life of local people and check in the biggest pagoda in Phu Quoc - Ho Quoc pagoda. After that we spend time on Bai Sao Beach swimming, relaxing and enjoying lunch. Then, we visit Coconut prison to learn something about the history of Vietnam and take a short walk to the fish sauce factory to see the production process. 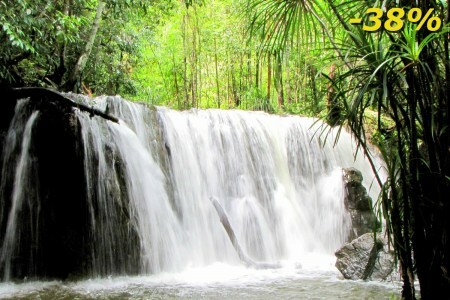 Depending on the season, our final stop is the scenic Tranh stream."